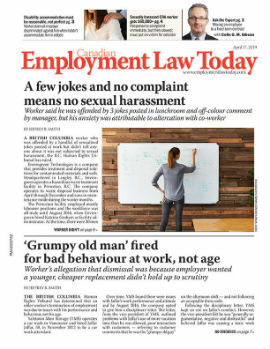 Employers have a duty to consider and accommodate the disabilities and medical conditions of their employees in the course of their employment, but as Robinson v Edmonton (City) demonstrates, this process is not one-sided: employees also have a responsibility to engage in the accommodation process. Susan Robinson was employed by the City of Edmonton as a bus driver. She suffered from environmental urticaria, a severe allergy that caused reactions such as hives and facial swelling when she was exposed to fumes such as perfume or diesel. In order to treat these symptoms, Robinson was required to take antihistamines, which caused drowsiness and made it unsafe for her to carry out her duties. As a result, she was often absent from work and went on periods of short-term disability (STD) leave. Following her latest STD leave, Robinson applied for long-term disability (LTD) leave. In the review process conducted by the LTD insurer, information came to light that Robinson’s medical condition could be accommodated if she were to drive an LRT train, which may mitigate her exposure to fumes. Her application for LTD was denied based on those grounds. There was documentation to show that the city acted on the information from the insurer and began pursuing the necessary arrangements to have Robinson return to work as the driver of an LRT train. Robinson spoke to her supervisor via telephone, and was told she could appeal the denial of LTD, that a leave of absence pending the appeal was possible, and that the LRT train option existed. The supervisor did not insist that she attend his office in person, require her to report for work, assign her a shift, or threaten discipline. Following the telephone call, Robinson resigned. The Alberta Human Rights Tribunal found that the city could have provided clearer communication detailing its accommodation efforts, but that the employee still knew or ought to have known that the city wanted to pursue the LRT option, and Robinson’s resignation effectively prevented the city from further fulfilling its duty to accommodate. The Alberta Court of Queen’s Bench upheld the tribunal’s finding that Robinson elected to abandon the accommodation process and found no failure of the city to meet its duty to accommodate. An employee seeking sick leave, STD, or LTD is also responsible for participating in the accommodation process. While employee resignations arising from a disability must be examined in the full context of the employment, Robinson v. Edmonton (City) demonstrates that the court is wary of equating the duty to accommodate with a duty to try to reverse a resignation. In certain instances, accommodation of medical conditions may mean creating and enforcing a scent-free workplace. In addition to requiring employees not to use perfume or perfumed products, it is also important to ensure that other products provided by the employer are not scented. Items commonly stocked in the workplace such as soap, lotion, and air fresheners are frequently overlooked. Robinson v. Edmonton (City) demonstrates the severity of scent-based medical conditions, and the safety concerns that may arise for an employer whose affected employees operate machinery. Although often trivialized, these conditions may have serious consequences not only for the health of the affected employee, but for the safety of others. As a result, employers should ensure they are taking the necessary steps to accommodate affected employees. Robinson v. Edmonton (City), 2014 CarswellAlta 74 (Alta. Q.B.). Laura Easton is an associate with Davis LLP in Calgary, specializing in litigation and dispute resolution. She can be reached at (403) 698-8753 or leaston@davis.ca.